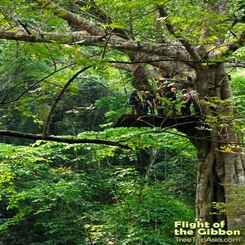 Chiang Mai Special – Gibbon Nature plus Gibbon Extreme! 2 adventures for the price of one – limited time – both tours 3,599 Baht!! For those who love nature and want to immerse into a 1500 year old ecosystem. 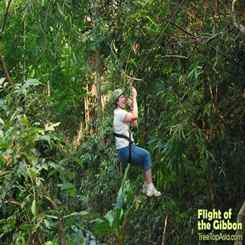 New extended skywalks where there is a chance to have a close encounter with wild gibbons. Also included is a trip to the stunning Kompong Falls where you can relax in the cool fresh water or trek alongside the seven tiered falls. And for those who want just a taste of Gibbon Extreme, we have portions of the tour designed so that you can walk around them instead! 2 tours for the price of one! 09.15 – Arrive at Gibbon Adventure Base / Welcome & Introduction. 09.30 – Put on safety gear / Go to starting point / Full Safety Briefing. 09.45 – Start the Adventure, 39 stations of high-flying fun. 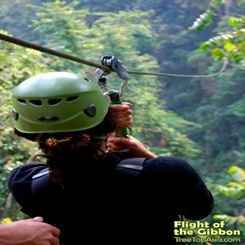 13.00 – Canopy Adventure finishes / Eat lunch. 14.00 – Jungle trek to scenic site. 15.00 – Program Wrap-up / Board vans and transfer back. 16.00 – Arrive back in Chiang Mai.